Now that Lutz has donned his cloak, he is fully ready to join Alis as one of the companions on the quest to wrest the rule of Algo from the hands of the corrupt Lassic. 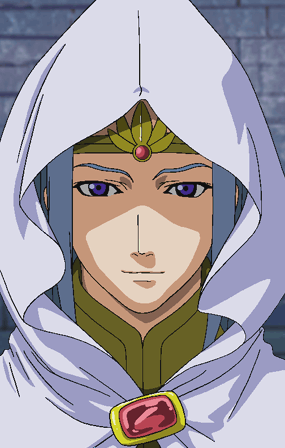 The white hood casts the upper part of his face into shadow, perhaps adding a bit of mystery to his look. His cloak is clasped with a red jewel, which will also be worn by Rune Walsh two thousand years later when he takes up the heritage of this wizard. Now that the party is completed gathered, there is a long, long break until the next cutscene in this game.